Summer. Stone fruits. And, of course, pie! I had the pleasure of hosting a pie making demonstration for a corporate event earlier this week, and in putting together pie making tips for that group, have some fresh in my mind to share with you. Particularly regarding the crust, as I think this can be the most tricky and intimidating part of the pie for some folks. Pie crusts are extremely versatile (fruit, custard, mousse, and frozen sweet pies; savory quiches; galettes; chicken pot pie; etc). They can be made in advance (3 days in the fridge; 3 months in the freezer); they require minimal ingredients that can be found in your pantry; they are fast to make and with minimal mess; and they taste great. Sold yet? One of the most important things to consider are the ingredients you will use, and with that, the temperature of the ingredients. Flour – you can use all-purpose or pastry. Pastry flour will give you a slightly more tender, less tough, product than all-purpose, but hey, sometimes we can’t just go tracking down fancy ingredients. If you want to use whole wheat flour, substitute for up to 50% of the amount of flour your recipe calls for. Fat – I prefer butter (shortening coats the roof of my mouth until you a) drink something hot, or b) eat something else to scrape it off – yuck!). You can also use shortening, lard, or a combination of either with butter. The butter must be COLD. I store it in the freezer, cut it up into small chunks (1/4-1/2″), then refrigerate it until I pull the dough together. Cold butter will give you a flakier crust. Water – Must also be cold. I fill a cup with ice and a little water as I measure everything else out, and by the time I’m ready for water it’s melted enough to scoop out what I need. Additional flavorings – Optional ingredients that enhance flavor, depending on what you’re doing with the crust. Sugar for very sweet pies, salt for less sweet pies or chicken pot pie, ground mustard for quiche, etc. I have really warm hands. So warm that chocolate melts in my presence. I’ve been experimenting lately with making the dough in a food processor so I don’t melt the butter on contact. It’s been working well. Pulse salt and flour together to blend, then dump in butter chunks. Quickly pulse about 7-8 times, checking to see how small the butter chunks have become. They need to be somewhere between the size of ground cornmeal and the size of peas. The frozen garden variety kind. The crust will be flakier towards the pea size of the spectrum. Now add the smaller amount of water according to your recipe. Pulse a few times, then squeeze the dough. If it holds together well in your fist, it’s done. If it crumbles, add another tablespoon of water and pulse 2-3 times, then check again. Once I have dough that’s capable of sticking together, I dump it out on plastic wrap and squish it into a ball. I knead a few times, then flatten into a disc and wrap with plastic. This next part is crucial, and requires patience. You must now chill your dough at least 45 minutes. If you try to rush this step, you will end up with butter oozing out across your counter. After the dough is chilled down, unwrap it on top of the plastic wrap, layer another plastic sheet on top of the dough disc, and whack it a bunch of times in both directions with your trusty rolling pin. This could be your ideal stress relief moment for the day if you plan it right. You’re done whacking when you can press firmly into the dough and you leave an indentation. Now you’re ready to roll. But first, a bakery math interlude. The plastic wrap is 12″ wide. Your typical pie pan, 9″ wide, has 1.5″ sides. Therefore, bottom + (sides x 2) = 12″. Use the plastic as your guide to determine if you rolled your dough out large enough. Instead of flouring your work surface, you’re going to roll your dough out in between 2 sheets of plastic. Adding extra flour to the dough makes it more chewy later. Roll from the center to the furthest edge, back to the center, back to the closer edge and back to the center. Now rotate dough 90˚ and repeat. If your dough stops spreading, the plastic is stuck; lift the top plastic off and gently lay it back on. If you find your dough is too warm (oozing butter or very sticky), slip it on a sheet pan and chill it down 5-10 minutes, then continue rolling. By now your counters should still be relatively clean, and it’s time to lay the crust into the pan. Remove the top plastic, put your hand under the bottom of the dough sheet, and flip it to invert into the pan. If you need to adjust it to center the dough, just gently move the entire sheet over. To fit the dough into the corners of the pan, go around the pan and lift the dough in sections to take advantage of gravity, dropping the crust into the bottom. If you push or pull the dough it will tear (but you can just fix this with a tiny bit of water on your finger). Now remove the bottom plastic. Viola. You have made yourself a crust. Fill and decorate the pie as you will. Go ahead, I’ll still be here when you get back. If you’ve used a top crust as well, brush it with egg or milk to wash, then sprinkle with sugar. This will provide gloss, browning, and crunch when finished. Be sure to cut steam vents, at least 3, or your pie may explode. OK, now you’re ready to bake. 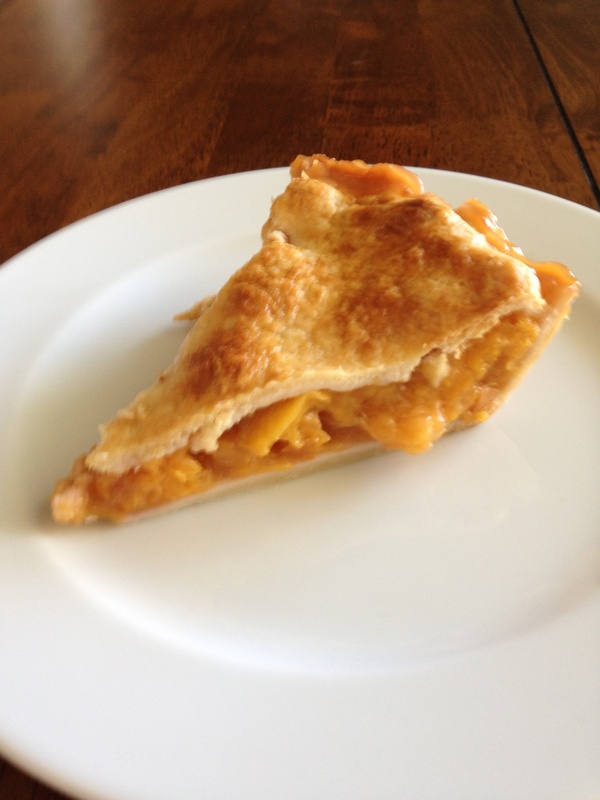 In baking, keep the pie in the lower 1/3 of the oven, as low as possible. Use a high temperature, around 400˚F. This will help to cook the bottom crust all the way through. When the top of the pie starts to brown, tent it with foil to create a heat shield and prevent it from burning. Don’t wrap the foil tightly or you’ll trap in steam and create sogginess. The pie is officially done when it bubbles out the top. It will make a glorious mess, which will eventually caramelize and burn on the bottom of your oven unless you put a sheet pan or sheet of foil under the pan. Do you feel ready to bake a pie now? 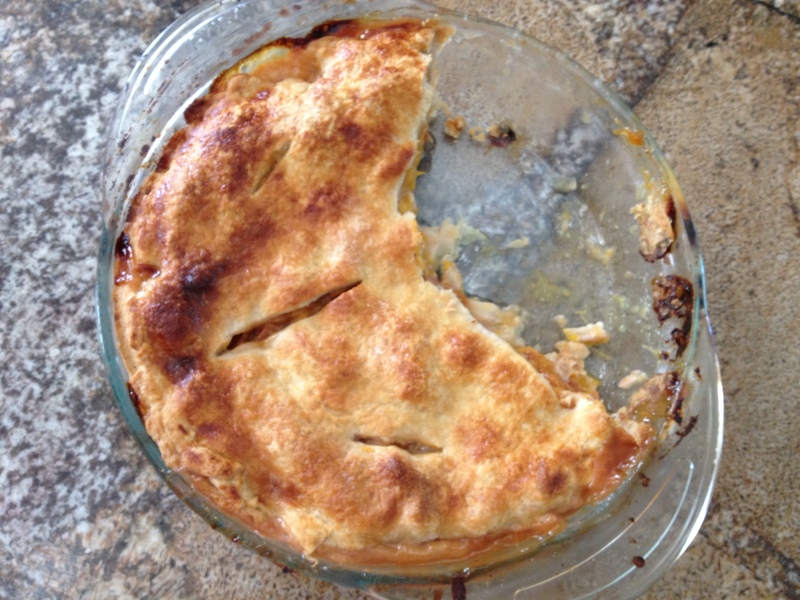 This entry was posted in Cooking, Cooking Techniques and tagged cooking technique, crust, dough, easy, pastry, pie by Amy Spindel. Bookmark the permalink.